An increasing number of Americans are seeing their way to better vision with the help of technology. Macular degeneration is the most common eye disease among the senior population. As many as 25% of those over the age of 65 have some form of degeneration. The macula is one small part of the retina, but it is the most sensitive and gives us the ability to see sharp images. With the help of new technology eye doctors are now able to overcome the visual effects of such eye diseases as macular degeneration, diabetes, glaucoma, and retinitis pigmentosa. 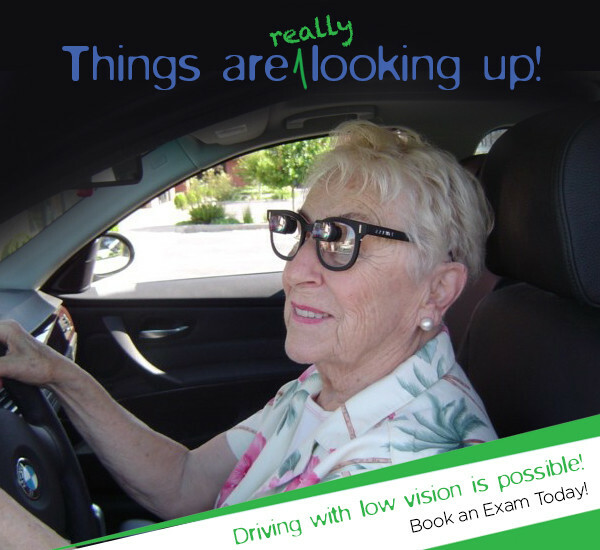 Believing there is life after vision loss, our eye doctor, Dr. Mills, uses miniature telescopes positioned in prescription glasses help those with vision loss perform such activities as reading, writing, playing cards, and in many cases even driving. Dr. Mills offers a free 10 minute phone consultation with every patient in order to determine if an evaluation would be beneficial. Once it is determined that our eye doctor can help, you may be scheduled for a 60 minute telescope evaluation. 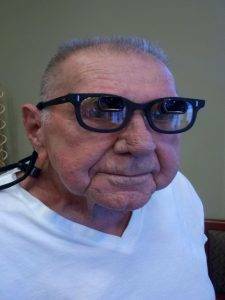 Custom low vision glasses range in price from $1,200-$2,600, a small price to pay for gaining your independence and vision back. With Telescopes, our eye doctor is able to incorporate a patients glasses prescription to help them see as well as their eyes will let them see. Telescopes help low vision patients maintain their independence and life style. They can drive and walk around with a bioptic telescope. They can sit in their favorite chair and watch TV and see their grand kids faces with telescopes. They can sit in their favorite chair and wear reading telescopes. 1. See Faces and TV better. 2. To be able to read again. 3. Continue driving, and see things at a distance as a passenger in a car. While there are other products to assist low vision patients such as handheld magnifiers and digital magnifiers, they all have serious setbacks in usability. Telescopic glasses enable a patient to perform multiple tasks, in various settings, all while remaining hands free. When it comes to quality of life, there is no replacement for the freedom and versatility of telescope glasses. 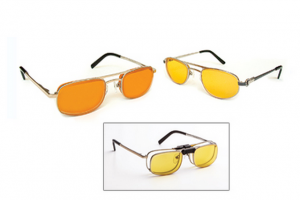 These are special glasses to bridge the gap between regular glasses and telescopes. They work well for mild macular degeneration patients that glasses aren’t just strong enough, yet not quite in need of telescopes. With macular degeneration patients, their central vision is effected. Usually, their peripheral vision is intact. 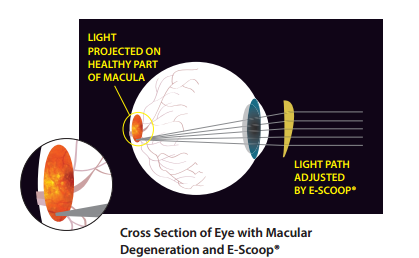 The concept of the E Scoops is that they use prisms to shift the image away from the macula onto a healthier part of the retina. Lens Thickness. (magnifies image some) not as much as a telescope, but more that regular glasses.